What did you think of Circling the Sun? All votes and comments are welcomed and appreciated! All votes and comments are welcomed! Please vote! Help us rate this month’s book! The Paris Architect………..In Three Words! Lucien Bernard, a talented young architect doesn’t hate Jews, he is just indifferent to them and their plight. So when he is offered a commission to design a hiding place in a posh apartment for a wealthy Jewish man, he is appalled. It was suicide! Why would he put his life in danger for a Jew? But as Lucien looked around the apartment, his head began to spin with ideas. He could do this, he could out smart the Gestapo! Truth be told, he could really use the money, This was a challenge he could not refuse…just this once! 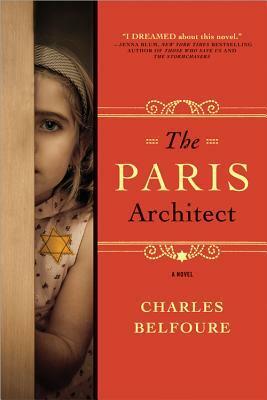 The Paris Architect takes place in 1942 Paris. I chose to listen to this month’s book, and The Paris Architect is a RIVETING AUDIO BOOK! How would you describe The Paris Architect…..In Only Three Words? It is time for the school kids and The Friday Morning Bookclub to hit the books. This month’s book, The Paris Architect will grab you from the very first page. It is exciting, full of surprise and impossible to put down. What better way to kick off the season! Please join us in reading……….and discussing The Paris Architect! 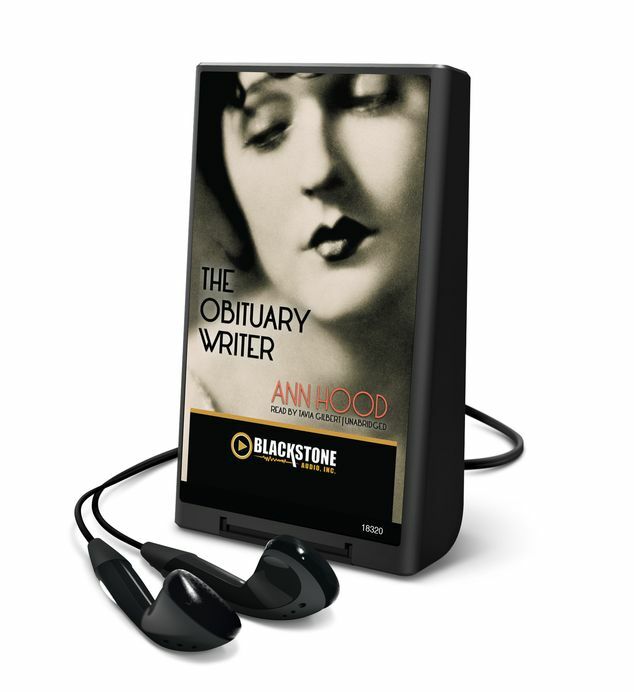 The Obituary Writer…A Very Entertaining Audio Book! While browsing the shelves of playaways at the library for a familiar sounding title, The Obituary Writer caught my attention. I had never heard of it, but with a title like that I had to check it out and I am glad that I did. It was everything I look for in an audio book. It was a manageable length, only 8 hours, not too complicated so it was perfect for listening to as I went about my daily chores and most importantly it was entertaining. The Obituary Writer reads like two different stories about two different women from two different eras, and although I had no idea how the stories were related, it all came together in the end. Claire and Peter appeared to be the perfect couple. They shared a beautiful daughter and were expecting a baby. But there was a problem. Both Claire and Peter suspected that Peter was not the father of the child Claire was carrying. Yes, Claire had fallen in love with a man she had met while campaigning for John F. Kennedy. A married man who unlike her husband took her serious and actually listened to her. Although the affair had come to a screeching halt after Peter had walked in on the couple in bed Claire could not stop thinking about Miles. Peter expected Claire to just go back to being the dutiful wife he had married, leaving Claire with the difficult decision as to what to do with her marriage. Could Claire leave her husband and risk losing her daughter in the process? Vivian Lowe was famous for the obituaries she wrote. These were not the typical obituaries people were used to reading, especially in 1919. Vivian’s obits did not just list the pertinent facts such as age, career and children. Vivian knew how to listen to people as they described their loved one and the obituaries she wrote managed to capture the true essence of the deceased person. Vivian understood grief and perhaps that was why she was so good at what she did. She had lost the love of her life and had been searching for him ever since he left her apartment the morning of the Great San Francisco Earthquake, never to be seen again. Thirteen years had passed, yet Vivian still could not accept the fact that her David was dead. His body was never found and she couldn’t help but imagine him walking around San Francisco in a state of amnesia. The Obituary Writer alternates back and forth between these two captivating love stories. The stories of two women from two different eras, both dealing with grief and loss, both looking for love. Listening to Claire talk about the Kennedy’s and trying to guess what color Jackie would wear to her next appearance added some welcomed levity to her story. The end caught me totally by surprise, although that may be because I wasn’t even trying to figure out the ending or the connection between Claire and Vivian, I was just going for the ride, listening to this engaging novel beautifully read by Tavia Gilbert. Orphan Train is one of those books you can read over a weekend. I found myself totally caught up in the intertwining stories of Molly and Vivian. Seventeen year old Molly was a foster child, had been bounced around from family to family and was used to disappointment. In fact, when things did go right in her life, she had no idea how to handle it. At such a young age she had already figured out that it was better to be perceived as tough and weird than weak and vulnerable. When once again, Molly found herself in trouble, her foster-mother, Dina was not at all surprised. Dina was always finding fault in Molly, considered her untrustworthy and was just waiting for Molly to slip up. This time Molly had tried to steal an old ragged copy of Jane Eyre from the library. Molly had wanted this book more than anything and was too shy to ask the clerk at the local book store to order it for her. The library had several other newer copies so who would ever miss it? Of course Molly was caught trying to sneak it out and it was either off to juvie or community service for her. Molly removed her nose ring, put on borrowed clothing and reported to the home of 91-year-old Vivian where she would complete her 40 hours of community service. Just what Molly wanted to do….clean up some old ladies attic. Although she did not realize it at the time, this assignment was going to be one of the best things that had ever happened to Molly. These two women had more in common than anyone would have guessed. When Vivian was a young girl she too had lost both her parents. Little by little, box by box Vivian shares her story of how she arrived in Minnesota via an Orphan Train. Orphan Train is a beautiful and inspiring story and I fell in love with both Molly and Vivian. Christina Baker Kline does a wonderful job of weaving these two very different, yet similar stories. The comparison between our modern-day foster system and the supervised welfare program called The Orphan Train Movement was fascinating. My only criticism is that it left me wanting more, and how can that be a bad thing? I want to know more about the Orphan Train Movement that transported over 250,000 homeless children from eastern cities to the rural midwest between 1853 and 1929. I want to know more about a welfare program which allowed couples to pre-select children by filling out an order form and checking off the age, gender, and even such traits as hair color they desired. Orphan Train is an excellent discussion book. Over coffee and eggs (although not necessarily omelets) we talked about Molly and Vivian’s plight which led to a thoughtful discussion of The Orphan Train Movement which was the predecessor to our modern-day foster system.Was it a good plan? How could it have been better? Orphan Train is a quick, easy read and more than anything piqued my interest. I give Orphan Train 4 1/2 omelets! How about you? Orphan Train is an Enlightening Historical Fiction based on a little known event in U.S. History. Imagine loading a train full of orphaned and abandoned children from crowded eastern cities and transporting them across the country to be placed in families living in the rural Midwest. This is exactly what The Orphan Train Movement did between 1853 and 1929. Help us rate this month’s book! All votes and comments are welcomed and appreciated! I often say that I learn more about history by reading historical fiction than I ever did in school. Between 1853 and 1929, trains departed New York, carrying orphaned children from the east coast to the farmlands of the mid west. This Welfare Program was the largest mass migration of children in U.S history, yet I had never even heard of Orphan Trains. Orphan Train is two intertwining stories, one set in present day Maine, the other in the late 1920’s. It is the story of an unlikely friendship. Molly was a product of the modern-day Foster Care System. Ninety- one year old Vivian was one of those orphaned children transported across the country by train. 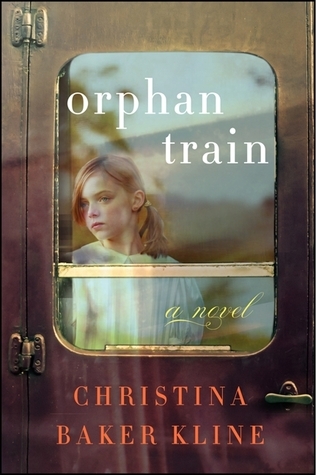 Christina Baker Kline’s Orphan Train is a “powerful tale of upheaval, second chances and unexpected friendship.” Please join us in reading Orphan Train.